When I was pregnant, we bought a convertible crib which transforms to a day bed and finally to a twin bed. This was way before we knew who Elijah was and certainly before we knew that he would have special needs. Once we realized that he desired a different sleeping arrangement, we toyed with the idea of getting him something different -something closer to the ground and something that would have railings - but decided to give the day bed we have already a try. He was doing pretty good just with his mattress on the floor, so two weekends ago we decided to transfer Elijah from his mattress on the floor to his day bed. Despite the post prior to this one, I am happy that we made the decision to forge ahead with this transition to a big boy bed. After all, Elijah wasn't really sleeping through the night before we made the switch. Best of all, Elijah seems happier about sleep. He beams when he gets in his bed and he seems to be proud of himself. 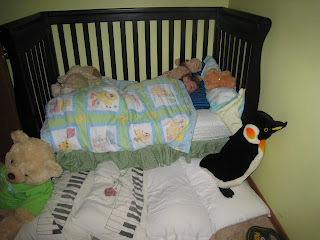 He didn't like being boxed in his crib and would cry every night when we put him to bed. Now, he seems to like knowing that he can get out of bed if he wants. Of course, the new challenge is teaching him to stay in bed all night long. I know it takes time and training for any kid to sleep in a bed, not just those with special needs. 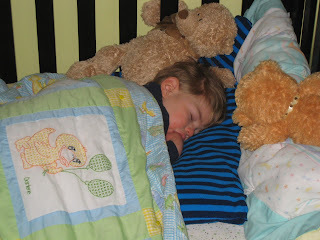 I know that little ones sometimes fall out of bed when they're learning and we've set up pillows as a precaution. We worry, of course, that he'll hurt himself. I'm not so much worried that he'll roll off of the bed (because of those pillows), but that he'll fall from a standing/jumping position. But, I have to ask myself... is this any different than any other parent making this transition? Perhaps in some ways, but I think it's mostly the same. Elijah is highly mobile, desires to be independent, and knows how to get down from his bed safely. So, we'll make his bed as safe as possible and try to teach him how to sleep in a little boy bed. We think he's ready and he deserves to be treated the same as we'd treat any other child, right? At least that's what I keep telling myself. That doesn't mean we're not afraid he'll hurt himself. We are afraid. But I don't want that fear to hold us back from giving him the opportunities to grow and develop, just as any other kid. Hmmmm. . . we have a similar bed for Charlie and yet he's still sleeping on a mattress on the floor. This post makes me think. Well it sounds like you are on the right path. You have put a lot of thought into it and that's really the best you can do. If he seems happy then I say keep it up! Sounds like Elijah is right on track with other children his age as far as graduating to a little boys bed. Our granddaughter Maya has just recently started sleeping on a twin bed. However to make it entertaining Stephen and Julie put a small tent covering on it. Maya really loves it. I think you did just the right thing. It's so important for kids (and adults) to feel proud of ourselves sometimes. You should be proud of yourself, too! Yay for Elijah and his buddy Scamper! I think you're doing the right thing. His feeling of independence is so critical. You're a great mom and Elijah is one lucky boy!!! I'll bet that you're glad to finally be rid of that convertible! I have never cared for convertibles for daily use. They just don't seem all that safe to me. In my opinion the Coupe cribs or even the Sedan cribs are much more suited to the type of energetic activity we guys get into. I will admit that a convertible looks nice and they can be enjoyable for general use WHEN THE WEATHER'S NICE. But if you want to put your foot in it, where's the protection if things don't go according to plan? You can install a roll cage or at least a roll bar in a coupe or sedan crib and no one even knows it's there. But put a cage or bar in a convertible and put the top down just once and everybody thinks you're nuts! I mean it they really are so uncool! If things get out of hand with a coupe or sedan crib and somehow you end up on your roof, it's no big deal to crawl out one of the openings and walk to where you need to go. Try that in a convertible crib and even if you have a cage or bar in it, the roof disintigrates and fills the inside of your crib with dirt, gravel, mud or worse! If you should end upside down in a pasture with your convertible, you don't even want to think about what can fill the inside of your crib. Nope! Take it from me Elijah, you're better off to be rid of that convertible. So just keep that pedal down and keep it right side up and we'll catch you on the next lap buddy!